On a cold and windy Monday morning, five birders in long-johns (only guys for a change: Roger, Mike, Terry, Jim and me) enjoyed a successful outing to Brunswick Point and then at Reifel Bird Sanctuary. Some hi-lites of the many species seen today included: a Ring-necked Pheasant, Ruby-crowned Kinglet, 60,000+ Snow Geese, 100+ Trumpeter Swans and at least eight Snowy Owls. Terry, Roger and Jim all took photos that I expect will be on our Picasa site soon at http://picasaweb.google.com/dncbirding. The drive through Tsawwassen First Nations Reserve was uneventful, but we were one of the first five vehicles to cross the new bridge over Deltaport Way which opened this morning. We stopped to watch a flock of 35 Trumpeter Swans feeding in a field near the road into the Musqueum “dumpy place”. 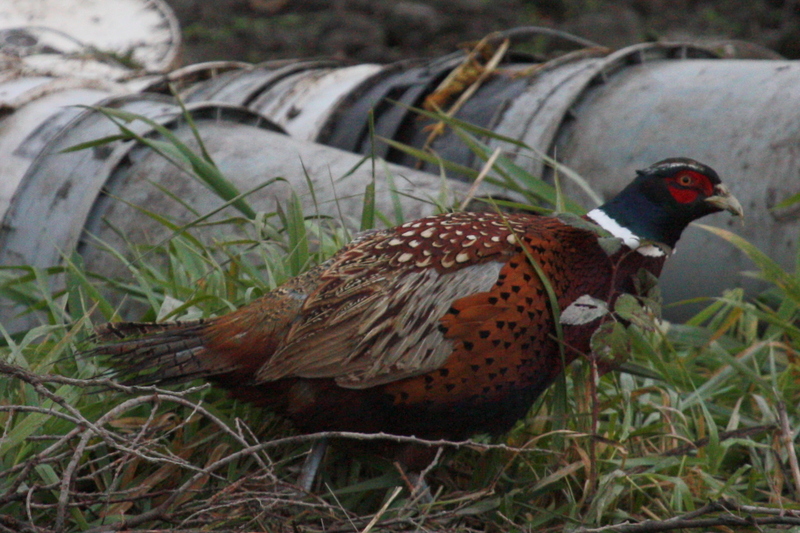 A brilliant Ring-necked Pheasant was on the road, along with some Golden- and White-crowned Sparrows. In the Fraser River, between Canoe Pass and the entrance to Brunswick Point, a Horned Grebe was close to shore and 6 Western Grebes a bit further out. We searched the trees at Brunswick Point, in vain, for the Great-horned Owl seen there on Sunday. Lots of Double-crested Cormorants on the posts where we used to see Black-bellied Plovers. Northern Harriers were everywhere, but we could not find a Short-eared Owl (several seen on Sunday). 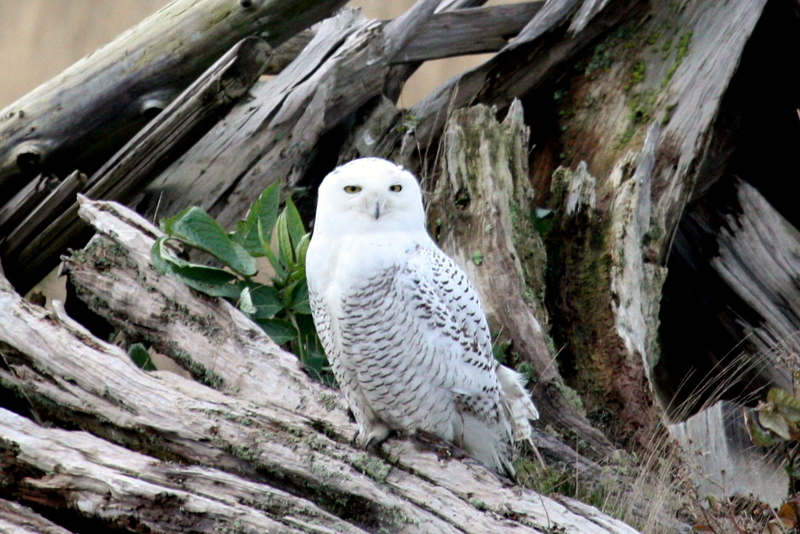 We found our target bird, Snowy Owl, and at least five in total at the Point. We got great views and did not leave the Trail. 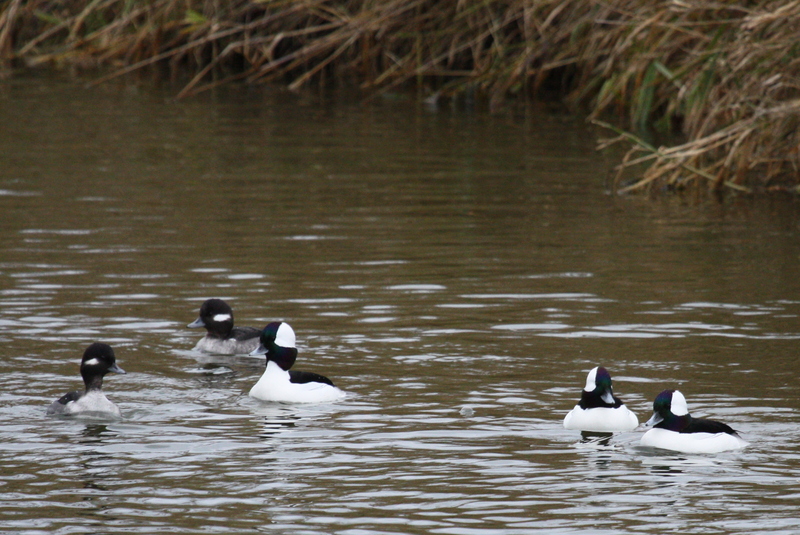 Surprisingly, they were not disturbed by the several hunters along the shore shooting ducks I guess. We saw no Snow Geese at Brunswick but way more than 60,000 in flocks over Westham Island and in the fields near Reifel. We were enchanted, as always, by the synchronized swarms of Dunlin along the shore and flying by us to land in the fields beside us. A couple of Black-bellied Plovers (which one of us tried, without support, to make an American Golden Plover) were nearby them. Having endured enough of the cold, we decided to check out our Mecca, Reifel Bird Sanctuary. Common Mergansers were in the slough along the entrance road and the resident Sandhill Crane family was at the office. 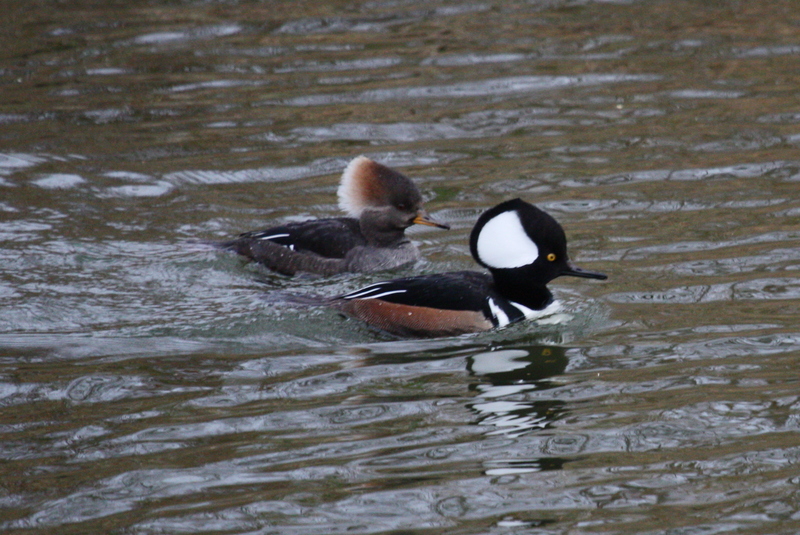 A couple of beautiful Hooded Mergansers were in the pond behind the office. On our walk to find Roger’s target owls (Barred and Great-horned seen on Sunday – we were blanked), we got great looks, as usual, at many beautiful ducks in breeding plumage, for example, Wood Ducks, over 30 Bufflehead (one pair was doing a “mating dance”), 3 female Ring-necked Ducks, one beaut male Canvasback, several Scaup (Greater? ), and the more common resident Northern Pintail, Northern Shoveler, American Wigeon, Green-winged Teal, Gadwall and Mallards. A Wilson’s Snipe flew by for everyone to see except the amateur. A Ruby-crowned Kinglet posed among a flock of Oregon Dark-eyed Juncos just as Terry broke his camera. We climbed the Tower and found three Snowy Owls in the marsh. A Red-tailed Hawk soared nicely right over our heads. We left Reifel at about 1:00 p.m., cold and starving. I do not mean to be sexist, but ladies seem to spot more birds than guys, and I eat a lot better when they’re along. Nonetheless, another super Monday morning. We will meet next Monday, November 28 at Petra’s for departure at 8:00 a.m. (may change the following week to 8:30 a.m.). Although this is a “Snowy Year”, there is also lots of other neat stuff “around the Bay”. Again, comments welcome, check out our Blog at: https://dncb.wordpress.com/, and let me know if you want off my Contact List. This entry was posted in *DNCB, Brunswick Point, Reifel, Snowy Owl, TFN, Westham Island. Bookmark the permalink. Thanks for sharing your birder adventures! Maybe I will start recording my own sightings in my neck of the woods.